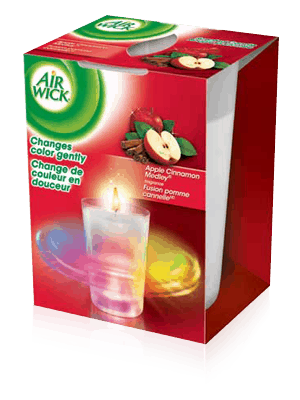 Air Wick® has a new product, the Color Changing Candle, that will brighten your world with its captivating light effects. 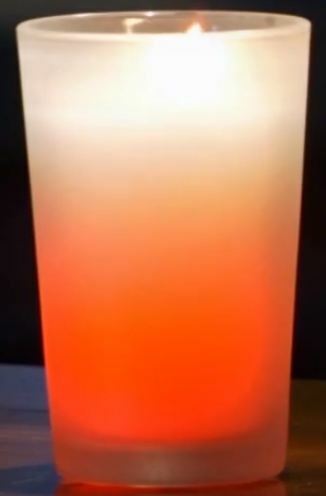 Once lit, a soft and tranquil glow illuminates through the wax. 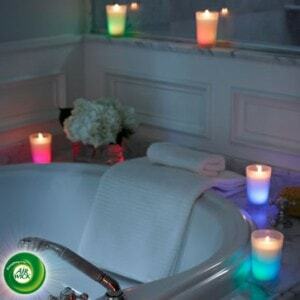 Watch how the glow gently changes color to create a captivating rainbow effect. See it in action for yourself here –http://www.airwick.us/colorcandle. You have to see it, it really is pretty to look at. The kids love it, too! Oh yes…and they available in three available fragrances – Apple Cinnamon Medley, Lavender & Chamomile, or Vanilla Indulgence!!! Yum! 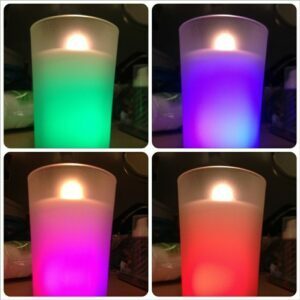 One (1) lucky Lady and the Blog winner will receive a new Color Changing Candle of their own! I love the color changing effect and would love to try Lavender & Chamomile scent. 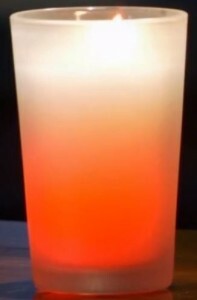 i love how the candle changes colors! It is so enjoyable to watch. I like the Apple Cinnamon Medley and the reddish colors are my favorite. I like the changing color because this is new for me with candles. The purple & pink is my favorite one. Vanilla Indulgence…there’s something about vanilla that always gets me!! The pink is my fav! I love the color changing feature! purple is the best color – love it changes – what a fantastic idea! I love the vanilla indulgence and the puple one is pretty. 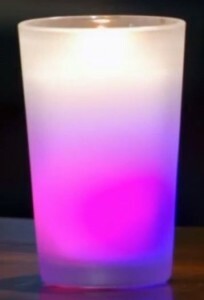 Love that it changes colors to create a captivating rainbow effect. Purple is beautiful. 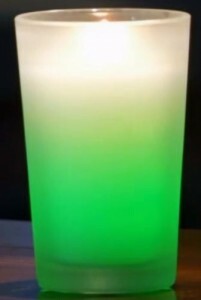 This candle is so cool…not only would it smell great but would be so cool to watch…I like the vanilla indulgence and it would be hard to pick a color because I like them all. I love the pinkish shade. I have to say the purple and pink are my favorite to. I like the color changing-ness of it. Purple is very pretty. I like the color changing effect. I just cannot pick just one color, i love they all smoothly change into each of the other colors! hoping for this one!! good giveaway, thanks! The Apple Cinnamon sounds great, but I think my daughter will love the changing colors. It’s so pretty! I love candles. I love the green color that it makes and the smells are awesome. I love all the colors and the way they change is just fascinating! I really like the purple shade. I like the color changing aspect of it. I like blue the best. I like how it changes color, blue is my favorite.